Kilsyth Rangers went down to a disappointing 3-1 defeat at Irvine Vics on Saturday. Gers were hoping to continue their recent good run of results against Ayrshire teams, but it wasn’t to be. Three goals lost in a 12-minute spell in the first half killed the game and although the visitors pulled one back in the second half the final result was never really in doubt. Yet there was a decent start by Rangers; they were all around the Vics goal area in the first 10 minutes with several chances made but a combination of poor finishing and good goalkeeping kept their goal intact. It was midway through the half before the home side had their first proper attacking move - and it brought the first goal in the 22nd minute. Kilsyth keeper David Tait could not hold a shot and it was picked up by Ross McKenzie who struck it home. All of a sudden Victoria were well in the game and playing with renewed confidence and they again broke away for Ryan Morrow to strike home a good second goal. 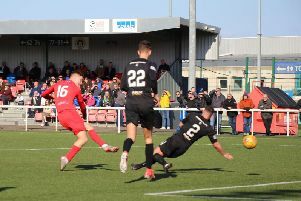 A third goal followed not long afterwards when Hamish McKinlay scored with a shot which hit the inside of the back post and into the net. Rangers were in a state of disarray and were fortunate not to lose any more goals before the interval. Two changes were made at half-time, Franny Kelly and Jordan Pirrie replacing Chris Reid and Corey Pearson and it looked as if it might bring a quick result. But it took until almost on the hour mark for Salim Kouider-Aissa to score for the visitors with a shot from distance. Rangers were now keeping up pressure on the Vics defence but shots were usually off target or easily coped with by a very competent keeper. Inevitably as time wore on it was becoming obvious that this was just not Rangers’ day and Victoria deserved their three points.